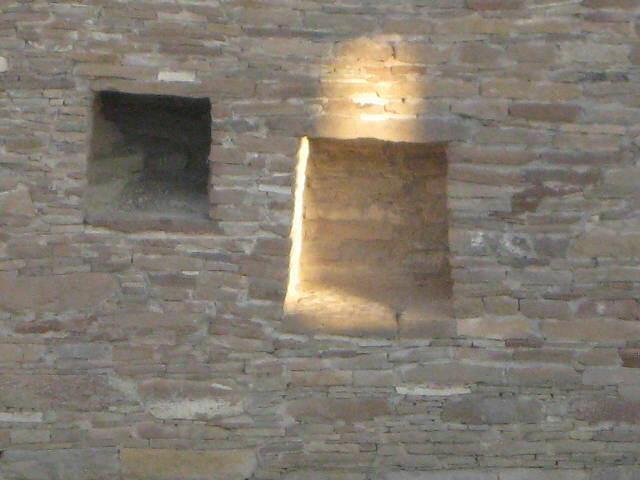 Between AD 900 and 1150, Chaco Canyon located in New Mexico and the American Southwest was a major center of culture for the ancient Pueblo peoples. Chacoans quarried sandstone blocks and hauled timber from great distances, assembling fifteen major complexes that remained the largest buildings in North America until the 19th century. 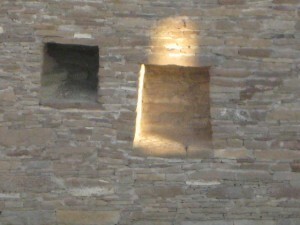 Many Chacoan buildings may have been aligned to capture the solar and lunar cycles, requiring generations of astronomical observations and centuries of skillfully coordinated construction. Climate change is thought to have led to the emigration of Chacoans and the eventual abandonment of the canyon, beginning with a fifty-year drought commencing in 1130. In future blogs, I will discuss how we as modern civilization can learn sustainability principles from ancient cultures in dealing with major climate change. 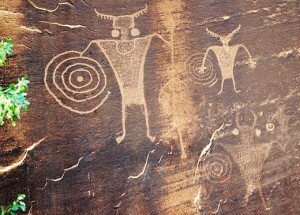 At a large butte in the canyon there is a petroglyph with two spirals. At spring and fall equinoxes, a spear of light bisects the one of the spirals. There is some evidence that lunar events are marked here as well. What is the purpose for these incredible alignments? There are many thoughts and ideas, but I suggest you journey to the sacred landscape of Chaco yourself and experience the Canyon in its silent conversation. This entry was posted in Earthwalks events by doogie. Bookmark the permalink. 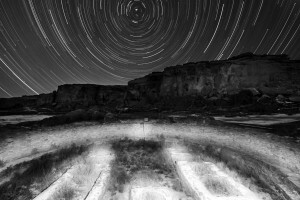 Quote: Many Chacoan buildings may have been aligned to capture the solar and lunar cycles, requiring generations of astronomical observations and centuries of skillfully coordinated construction. Who wrote this? It is without question that these alignments were made, not may have been. The studies by the Solstice Project alone brought much of that to light, pun intended, and the light dagger within the spirals on Fajada Butte is aligned to the moon as well as the sun. 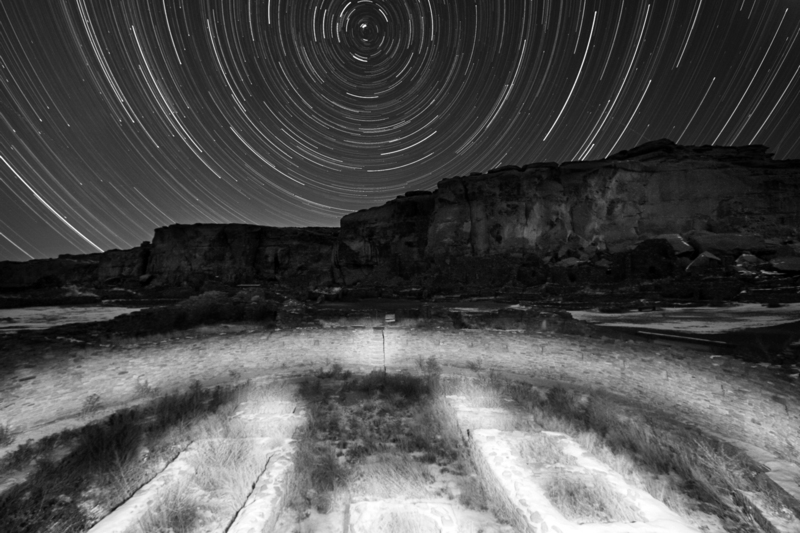 Then there is a significant camp of people who deny the possibillity of Chaco Canyon being a permanent residence of thousands of inhabitants. Not enough resources. Just like in modern Lincoln County, NM, pop. ~22,000, there are not enough resources for any more. Please also note that there a few who believe the Aztec artifacts found at Chaco denote a oneway trip, not minimal trade, for there are structures found in areas controlled by Aztecs in Central and South America quite similar to Pueblo Bonito. IMO this article and the story narrated by Robert Redford is a travesty and restrictive to gaining any understanding of what really happened there.